Fresh Creative | We #StickByOurGirl, Immi Dorsett! Hockey season for 2018 is ending with a bang! This October, a remarkable team of incredible young women will represent the ACT at the National Women’s Outdoor Under 13s Championships. One of them is talented teenager Immi Dorsett. Like the team members of our Canberra design studio, Immi has a vision, discipline, and a positive attitude, which we believe are qualities that will take young people far in life. How can we resist her her sunny smile and her skill with that hockey stick? So as Immi Dorsett and her teammates go out to represent the best of Hockey ACT, we at Fresh Creative are excited for them. Stay tuned to our blog and Instagram for the next few updates on this phenomenal teenager. 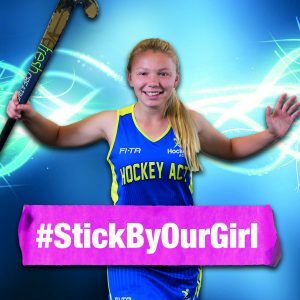 We’re proud to say that we #StickByOurGirl!